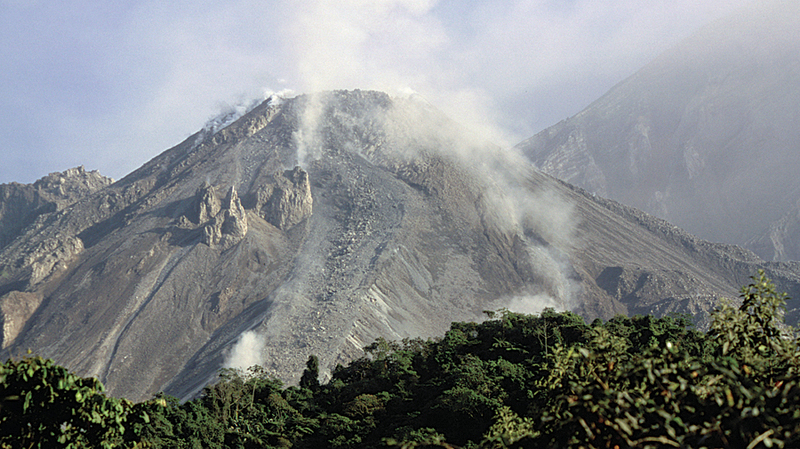 On the afternoon of November 28, 2012, the Guatemalan volcano Santiaguito erupted, launching sand and ash three kilometers into the air. Lava and gas spewed into the surrounding area—some in areas as far as 80 kilometers away. This eruption was considered by the authorities to be a “very strong” one, and the National Meteorology Agency recommended restricting air traffic in the area. Nevertheless, according to the National Coordinating Commission for Disaster Reduction (CONRED), there was no immediate need for evacuation of populations closest to the mountain. GeoCensos, a nongovernmental organization comprising international and Latin American experts and researchers, was invited by Washington, DC-based humanitarian organization iMMap to join coordinated efforts in the area to identify damage and emergency response for the Guatemalan government and report them to CONRED. GeoCensos explores topics related to geospatial technology, such as data mining and digital mapping applications, applying recent census results. A large part of the organization’s core activity is to produce information updates based on censuses and geographic information trends happening in Spanish-speaking countries. In the case of the volcanic eruption, GeoCensos was looking for applications that could streamline the provision of real-time georeferenced data, such as social networks, to understand what was happening during the event. Staff at GeoCensos decided they needed an easily accessible tool to describe at a glance what was going on live in the affected region. Social media is well on its way to becoming a valued source to understand emergencies, but many times, there is a lot of data being posted quickly. Trying to channel the flow of this “fire hose” of information is the key to applying it. Researchers at GeoCensos were looking for a tool that could help them make sense of all the available near real-time data being posted when the volcano erupted. They understood that the coordinated emergency efforts of all the first responders could benefit from using these tools. The one they chose was the social media widget for Flex developed by Esri and available online at ArcGIS.com. 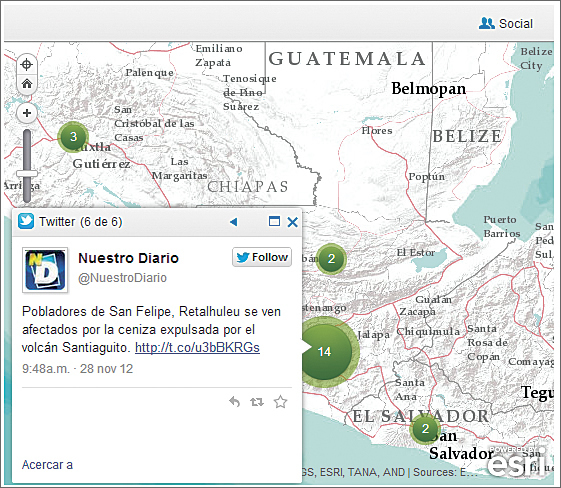 Tools like Esri’s social media widget can be particularly effective if the general emergency system in a given country aims to alert the public and reduce the impact of disasters. During a time when many budgets are shrinking, involving the community to generate geospatial data can be very helpful. GeoCensos found that introducing these new nodes of emergency information—information from social media—together with census data, especially housing, can save time and effort at moments of crucial importance.